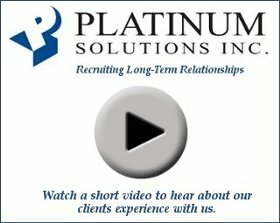 At Platinum Solutions we realize that looking for a new job/career can be very stressful and confusing. If you are not focused with an effective plan to help you out, there is a great chance that a lot of time and money will be lost. The stress and pressure that comes with an unsuccessful job search can often times be overwhelming. If you need help developing a targeted plan that can increase your chances of landing the right job/career, contact us to arrange a free consultation to see how we can help you in this challenging economy and time in your life. These are the “4 Keys” needed to conduct an effective job search! If even one of these is missing from your current job search you may very well be wasting a lot of time and effort. However, if all areas are implemented effectively it can add up to job offers that lead to a great career and future for YOU! Knowing how to effectively display and market your strengths, accomplishments and talents is critical to not only getting hired by the Company you want to work for, but also getting promoted and having a fantastic career! Contact us at info@pshouston.com or 713.462.6414 to arrange your FREE consultation and résumé review now! "In my career I've never had a hard time finding a job. However, during this tough economy that has really changed for me. Platinum Solutions knowledge and training on the "4 Keys" to Conducting an Effective Job Search made things so much easier for me. All I can say is, I wish I had called on your services much sooner! It would have saved me a lot of money and time without working." To the fullest extent permissible pursuant to applicable law,Platiunum Solutions disclaims all warranties, express or implied, including, but not limited to, implied warranties of merchantability and fitness for a particular purpose. Specifically, but without limitation, Platiunum Solutions does not warrant that: (i) the information on this site is correct, accurate or reliable; (ii) the functions contained on this site will be uninterrupted or error-free; or (iii) defects will be corrected, or that this site or the server that makes it available are free of viruses or other harmful components.